The $25,000 will come from a reserve fund created when Champlain Township sold the Champlain Hydro Commission to Hydro One several years ago. At the time of the sale, the township stipulated that the funds generated from the sale of the public utility in Vankleek Hill would be deposited in a reserve fund to be used to benefit the residents of Vankleek Hill. The hydro commissions of Vankleek Hill and L’Orignal had merged to form the Champlain Hydro Commission at the time of municipal amalgamation. A similar reserve fund was established for L’Orignal. 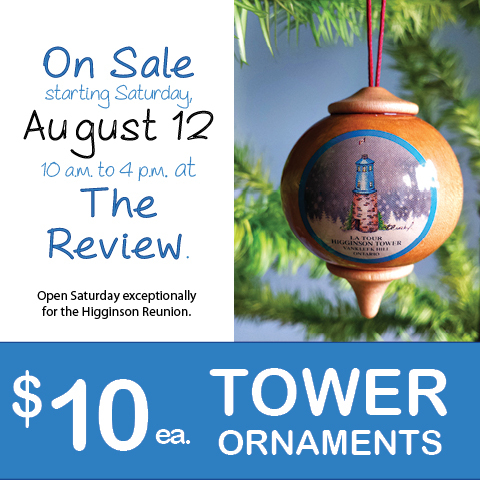 And there was more good news for the Higginson Tower Committee last week when it learned it would receive $24,400 from the Ontario Trillium Foundation to assist with building the upper wooden portion of the tower. While the stone portion of the tower was restored last summer at a cost of about $43,000, the incorporated, not-for-profit Higginson Tower Committee has continued with its public fund-raising campaign, which has an objective of $110,000. To date, donations from the public, combined with fund-raising activities by the committee total about $93,000. “The community has been really generous, but we need that last $17,000 to complete the project,” says Gary Barton, mayor of Champlain Township and a member of the Higginson Tower Committee. Plans for the interior wooden portion of the tower, including an inside staircase, in addition to the wooden exterior shell of the tower, had been prepared earlier this year by Vankleek Hill architect J. Denis Séguin, so that lumber could be ordered for the tower. Of particular concern for this one-of-a-kind restoration project was the need for 10 x 10-inch large wooden upright beams to support the tower structure to its 52-foot height. These were obtained through Thomas Sproule, of Guelph, who is a native of Vankleek Hill and who continues to work in the lumber business, following in the footsteps of his late father, Ivan Sproule, who for decades owned and operated Sproule Lumber Limited, located on Highway 34 south of Hawkesbury. Construction of the top portion of the tower has ultimately been divided into three phases. Phase I includes construction inside the stone base of the tower, along with the interior staircase to the first landing. Phase II will include construction of the tower shell, along with the remainder of the interior staircase. Phase III of the construction work will include finishing of the tower, including the reproduction tin exterior cladding. The stone portion of the tower has been sealed up recently as a wooden door, made for the tower courtesy of Bob Hanes of Vankleek Hill, has been installed, along with shutters, also made by Hanes, on the lowest window opening. Since Trillium Foundation funds have been secured, a concrete floor has been poured inside the tower and brackets welded in place to accept the large support beams. The Higginson Tower Committee has awarded the contract for the first phase of construction – i.e. the interior framing and interior staircase to the first platform – to New World Timberframes, of Williamstown, Ontario. The Higginson Tower Committee had obtained earlier restoration estimates which predicted that the entire project would cost between $75,000 and $100,000, but stonework was more costly than anticipated and a first round of tenders for the upper portion of the tower came in much higher than anticipated. It was at that point that the committee decided to break the balance of the project into phases. “But now, we are almost there in terms of fund raising,” says André Martel, who co-chairs the Higginson Tower Committee along with Louise Sproule. “Thanks to the Trillium Foundation and to Champlain Township, we are well on our way,” Martel said, adding that the committee had other funding applications in progress. The committee now estimates that it will cost about $75,000 to $80,000 for the construction of the wooden portion of the tower; that cost includes an estimated $12,000 for reproduction tin. Lumber for the wooden portion of the tower has already been purchased by the committee. New World Timberframes is currently at work assembling the inside staircase and platform after four support beams were lowered into the tower by a crane recently. The original grist stone from the tower, which served as a wind-powered grist mill in its early days, has been lowered into place inside the tower. Louise Sproule said the committee will be setting a closing deadline soon for donations. “We have to give Martel & Sons Monuments enough time to prepare all the cobblestones and the plaques for installation in 2007. The committee will likely set a spring date as the end-date for donations. When we look back at the incredible response from the public, it’s just amazing. It shows that people around here and also those with connections to Vankleek Hill want to see history preserved,” Sproule said. The last few weeks have been busy ones as far as the Higginson Tower is concerned, Sproule said, adding that within a few weeks, more construction photos of the latest projects will be posted on the Higginson Tower web site, along with more information on construction.